The Purcell Room is situated within the Queen Elizabeth Hall building at Southbank Centre. Located on the south bank of the River Thames between Hungerford Bridge/Golden Jubilee foot bridges and Waterloo Bridge, it is close to the London Eye and approximately 15 minutes walk from Tate Modern. 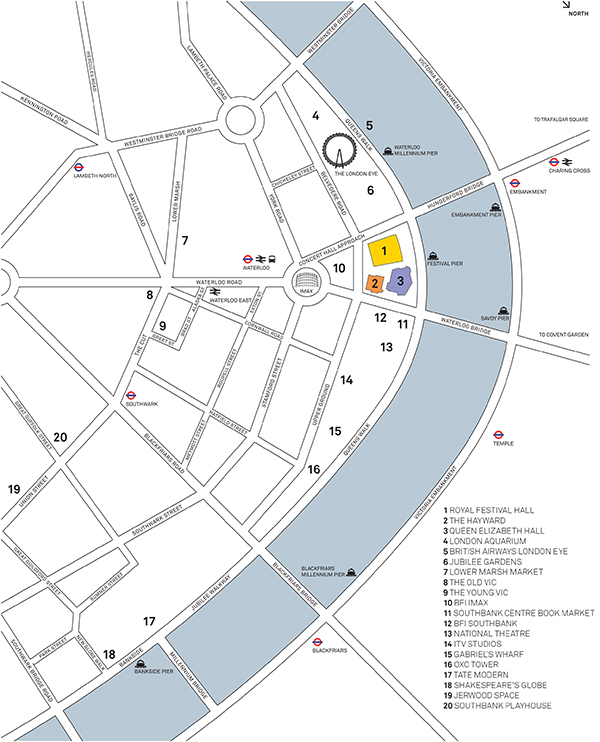 Click on map on this page to see layout of the Southbank Centre. 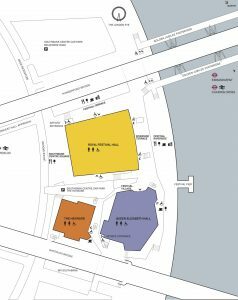 See the Purcell Room site for information about the venue and the surrounding area. Google Map of the Southbank Centre with walking directions from Waterloo Station (nearest Underground). Go to Access for directions to Queen Elizabeth Hall/Purcell Room from nearby Underground stations. For details of how to get to the Southbank Centre see TRAVEL. Please contact us if you are disabled and require assistance as we will need to give you directions to access the Purcell Room in the Queen Elizabeth Hall. The Purcell Room is wheel chair accessible. Once inside the venue access is step-free. Two places are available in the Purcell Room auditorium for wheel chair users. There is an adapted toilet just outside the Purcell Room in the foyer area. Guide dogs are permitted. Two places are available in the Purcell Room auditorium for people with guide dogs. The Purcell Room is fitted with a Sennheiser infrared sound induction system for hearing impaired people. If you require this facility please let us know so that we can reserve an appropriate seat and ensure the equipment if fully functioning. Information can be provided in alternative formats on request.